Assen 2014 saw Alex Marquez celebrate back-to-back Grand Prix wins for the first time in his career. However, perhaps the Moto3™ race will be better remembered for a number of incidents which saw championship-contending riders losing out. 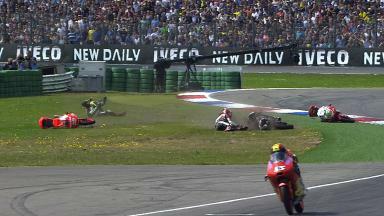 Barely a minute after the race started, Romano Fenati (at the time sitting just seven points behind championship leader Jack Miller) missed his braking point at the Geert Timmer Chicane, running across the gravel trap and sinking to the back of the field. 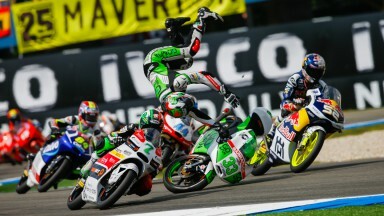 In the process, compatriot Enea Bastianini was forced to run wide and therefore have to rejoin the action in the heart of the chicane, in-turn flying into the air and retiring from the race following a touch with Efren Vazquez. 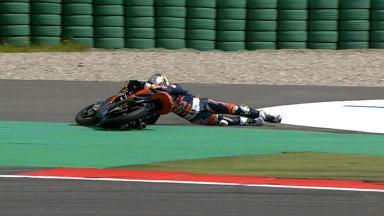 As if this wasn’t enough drama already, while Bastianini picked himself up and Fenati rejoined the circuit, championship leader Jack Miller was caught out by the bump under braking for Haarbocht and thus found himself lamenting a second retirement in three races. 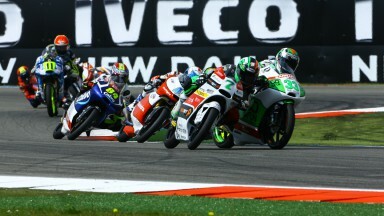 Now the challenge was for Fenati to pick off his competitors, one by one, to reach the eighth place which would hand him the World Championship lead for the first time this year. 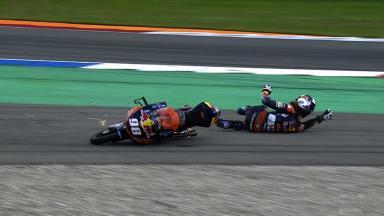 He did so successfully, only to fall just seconds later – ironically, after clipping the rear wheel of Miller’s team-mate Karel Hanika, who had slowed fractionally while battling in a multiple-rider scrap that roared for much of the race. 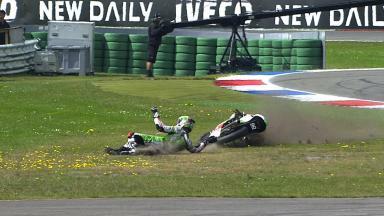 Adding to the irony only further, Hanika himself would crash at the same De Bult corner just a handful of laps later. 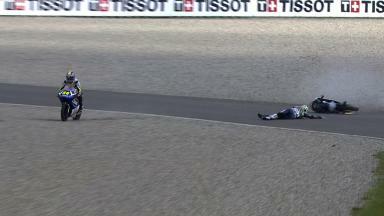 Niklas Ajo was not out of trouble on this particular Saturday, either. The Finn, who two weeks earlier in Barcelona had performed a remarkable save on the final lap of the race, this time highsided spectacularly. Directly behind, Jakub Kornfeil succeeded brilliantly in avoiding the stricken Ajo, but would plummet to an eventual 11th place for his trip through the gravel trap. 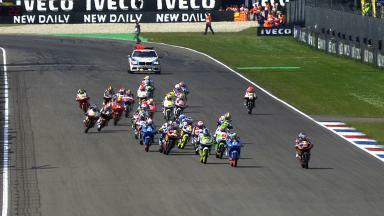 In a race full of incident, the last would come at the final corner of the Grand Prix. On this occasion not one, not two but three riders all suffered, as Luca Grunwald’s troubles took out the unfortunate Alessandro Tonucci and Juanfran Guevara in one fell swoop. 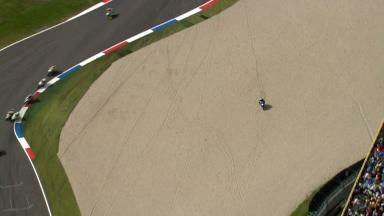 Two retired on the spot, while Tonucci would push his bike across the line, with a flat rear tyre and in 26th position.